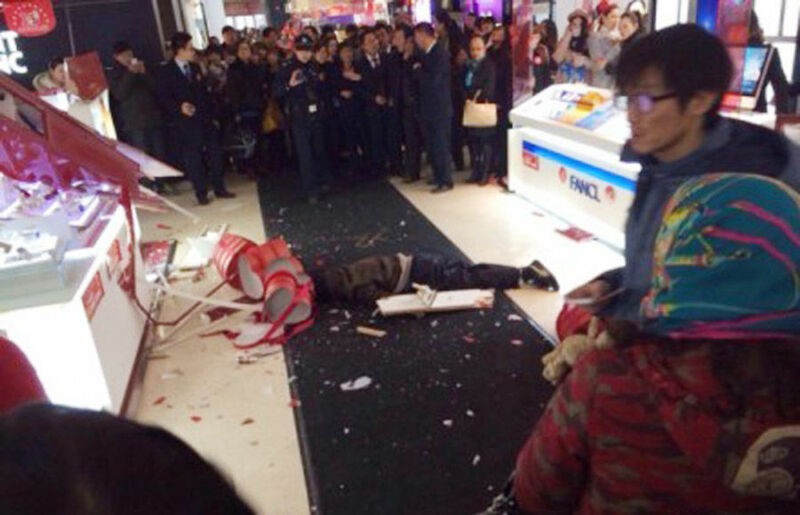 According to a news article, Man commits suicide after girlfriend refuses to quit shopping, a man in China jumped to his death after his girlfriend insisted on going to one more shoe outlet after an enormous shopping spree. I find this hard to believe, and I wonder if this is a real story, or one made up by the Chinese media. The Huffington post has a story about it, which cited two Chinese sources (source 1 source 2). The Chinese sources are in Chinese so I can't read them, but it also links to a collection of photos from the accident (might be slightly too graphic for some). It should be noted that he didn't jump to his death "only" because of too much shopping, but after an argument that ensued due to too much shopping. Since the version of his girlfriend is not available, we don't know for sure what happened at the argument. It could be (speculating here) that they broke up during the argument and then the headline should be Man jumps to his death after a break up which is much less sensational. tl;dr Suicide in a shopping mall: True. Suicide because of too much shopping: Maybe. On December 7th (2013) at 15xx hrs, a male aged about 40, entered the Golden Eagle mall through the south entrance and into the hypermarket, rushed up to the lift area of the 7th floor, jumped over the protective barrier and fell down, and died on the spot. The identity of the dead person is still being verified, will the victim's family and people with more information quickly communicate with the authorities. That a man committed suicide that day does not seem to be in doubt (photo of body). Regarding the cause of the man's jumping to his death, at present, the Internet's viral message is that "It was because he found girlfriend's shopping purchases too expensive". But based on Jiangsu Television reporters' latest news from the police, this could just be hearsay - rumors - guesses - speculations from the internet - no proof of this claim is yet forthcoming. The police state that the true cause of the suicide is still being investigated and they welcome information from netizens. I have not been able to find a more recent news item on this matter. According to witnesses, the pair were arguing, stating that they had shopped one storey after another for 5 consecutive hours, the man was already feeling very tired and wanted to go home, but the girlfriend insisted on continuing with the shopping. And so the pair started arguing, and the man loudly said, "You have more shoes than you can ever wear in a lifetime, and you still want to go to more shoe shops?" The girlfriend replied testily, "You petty miser, you're ruining the atmosphere of Christmas!" The man seemingly could not stand this provocation, flinging in anger all the big and small shopping bags of new clothes on the floor, turned around, jumped over the protective barrier, and fell from the 7th floor. The above story seems however to be an exact translation of the story given by the Dec 9th Daily Mail article. That the Daily Mail is the original source of this shoes story is corroborated by the fact that the above story (in Chinese) seems to appear on Chinese sites only on Dec 9th or 10th. Even though the Daily Mail refers to this man as "Tao Hsiao", it is unknown if this man is really surnamed Xiao [pinyin], the police have not given more details, and the man's identity remains temporarily a mystery. Finally, contrary to the suggestion of the earlier answer here, there is no evidence that the couple ever broke up, prior to the man's unfortunate death. Not the answer you're looking for? Browse other questions tagged china suicide .